With the upcoming release of Module 2: Shadowmantle, we’ll be adding a major new item type to the game – Artifacts. With these items, we wanted to create a feeling of advancement and attachment to an item; something most items don’t get to have. These items will become permanent fixtures for your character, and will be able to level up and get more powerful as you advance. We tried multiple iterations of different ideas for Artifacts, and we’re really happy with the system that we’ve ended up with. Around level 20, your character will get a new quest, which will send him/her on a hunt for a lost item of power. After recovering that item, you’ll be given a choice of three Artifacts to start with – Lantern of Revelation, Waters of Elah’zad, or Aurora’s Whole Realms Catalogue. Each of these items will provide you with a small stat bonus, and when slotted into your Primary Artifact Slot, a new power! Each power is different: one provides a heal over time, one creates an AoE debuff and damage, and one… well, one that can provide some single target damage in combat, but that also summons a shopkeeper when out of combat. This shopkeeper will sell you healing potions and other various items, as well as buy any items that you might want to sell to him, before he teleports back home. 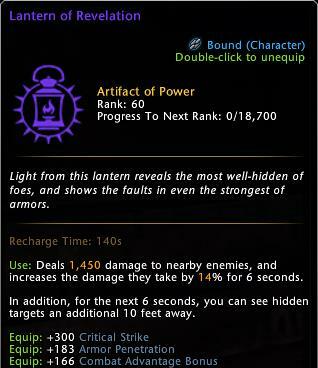 These powers have a considerably longer recharge than typical player powers, as they add new utility and powers that many classes don’t have access to. We tried many combinations of power levels with various recharge times, and found that Artifacts felt best at around the 2-3 minute recharge mark – short enough to be used frequently, but powerful enough to turn a fight around. 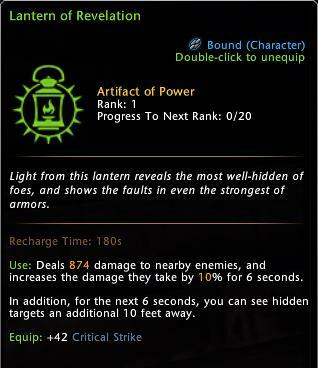 As mentioned in our previous Dev Blog on the Item Progression System, Artifacts will also be using our new Refinement System. They’ll be able to consume any Enchantments, Runestones, Refining Stones, and even other Artifacts to get more and more powerful. This progression works similarly in function – you’ll use the same Refining process, but the end results are slightly different. Unlike Enchantments and Runestones, which have to Upgrade at every Rank Up, Artifacts only perform an Upgrade step when they cross quality boundaries – from Uncommon, to Rare, to Epic, to Legen - wait for it – DARY! 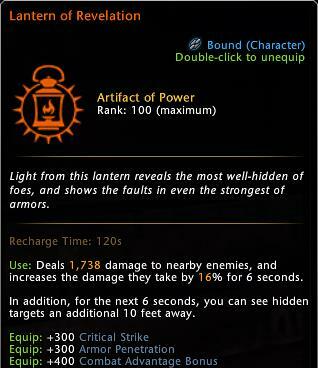 As you Refine the Artifact, increasing its Rank, the stat ratings that the Artifact provides increase. At Ranks 30, 60, and 99, you’ll be ready to Upgrade your Artifact to the next Quality. These Quality upgrades come with larger benefits. Getting to Blue quality adds a second stat. Getting to Purple quality adds a third stat – one which is not typically found on most items. 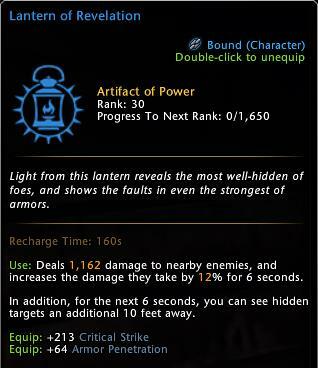 Every Upgrade will also reduce the Recharge Time of the power, as well as increase certain aspects of that power – such as the damage, debuff strength, etc. As stated, all players will get access to their first Artifact from a quest – I recommend you go out and get yours as soon as you can – but then, you might ask, where does one get more, and why would they want more? Well, at level 60 you’ll unlock 2 additional Secondary Artifact slots. When an Artifact is slotted into these, you’ll only get the stat bonuses from that Artifact, and won’t be able to use the specific power associated with it. But any time your Primary Artifact Power isn’t recharging, you’re free to swap out which Artifact is in your Primary slot, giving you flexibility in which power you want to use for different situations. Every single Artifact in the game is detailed out like this, showing you where you need to go to get it. In addition to this one from Malabog, you’ll be able to find one at the Trade of Blades, and two from new content coming with Shadowmantle! On top of these 7, we already have many more in the works, which we’ll be introducing via multiple ways – new events, new quests, and more. If you want to find out more, come check them out early on our NeverwinterPreview shard. Hope to see you there!